Jaybird’s was remodeled in 2010 but we kept and restored much of the original wood paneling and flooring that was milled in our parents' sawmill in the early 1950’s. Our family prides itself on home-on-the-range hospitality. We are fortunate to have our roots in such a special place and would love to share this slice of heaven with you. We continue to farm the homestead and our 7 cabins are spread across 260 acres. We have horses and cattle that roam the creeks and meadows. You might see us on the farm too, but our homes are farther away. We love extending our local knowledge to our guests - just ask. Sleeping arrangement: 3 bedrooms (1k,1q,1d) - two bathrooms. Our Jaybird's Cabin is handicap accessible. A courtyard wraps around the west, south and east sides of the cabin. It was formerly Tom and Jay Foley's home. It is named after our mother, Jaybird. The camp chef will love Jaybird's large kitchen. The comfortable sitting room stays toasty and warm with the wood burning stove. Private Location. Historic Location. Great Location! Near Bob Marshal Wilderness, Flathead Lake (the largest natural freshwater lake in the west), Big Sky Waterslide, Hungry Horse Dam and Reservoir, Glacier Maze and Glacier National Park. Choose any direction and explore a multitude of trails, lakes and streams from your Martin City base-camp cabin. Summer in Northwest Montana provides lots of time for your choice of outdoor activity. Flathead Valley is nestled among captivating big sky country and mountain peaks. Area beaches abound: Whitefish Lake offers sandy beaches, Lion Lake is so secluded (favorite swimming lake for locals), Lake Five is two minutes to the Park -- and all are surrounded by the Rocky Mountains. 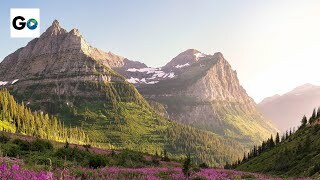 Glacier Park is the "The Jewel Crown of the Continent” and it’s right in your backyard. Don’t miss the Going-to-the-Sun Road. Once off the highway, trails are the mode of transportation: Hiking, biking, horseback riding and more. The nearby Whitefish Mountain Resort has more than 3,000 acres of skiing terrain - ride the lifts in summer and get a bird's eye view of scenery you'll never forget!